SOUL FOOD for the Hungry Adult: 2nd Sunday of Advent, Dec.9th 2012. SOUL FOOD FOR THE HUNGRY ADULT: SECOND SUNDAY OF ADVENT: DECEMBER 9TH, 2012. Can I invite you to imagine you are reading the following in 35 years time, in 2047? ‘When Benedict XVI was in the seventh year of his Pontificate, when Mr. Enda Kenny was Taoiseach in Ireland for almost two years, David Cameron Prime Minister of the UK for nearly three years, and Barack Obama was nearing the end of his first term as President of the United States, while Syria was at war with itself, while Eqypt was facing uprisings against President Morsi… that was the time when Kate and William announced that they were expecting their first child.’ How’s that for a start? It tells us the date pretty accurately as in late 2012. In other words, in that particular year, when all of these people were in place, John came along. No vagueness about dates and times,- an historical moment is named for the actual events. The Christian message, after all, is not about philosophies or myths or theories, but about history and facts, about definite times and places. In other words, John, and Jesus from Nazareth, and the other characters in the story all fitted into a precise moment in human history. They were REAL people! The events occurred in REAL time, in a REAL particular place on the planet, called Palestine. And the REAL person, John the Baptizer in the Gospel today was giving and is still giving to this generation a REAL message: ‘Prepare a way for the Lord!’. Advent is as simple as that. 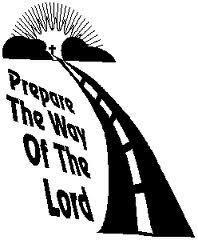 ‘Prepare a way for the Lord!’ Make a clear highway for your God who wants to come to you and to the world. The Opening Prayer for this 2nd Sunday of Advent has this: ‘Open our hearts in welcome, remove the things that hinder us from receiving Christ with joy.’ Instead of crooked roads, and bad bends, could we prepare a ‘motorway’ so that God can come more quickly into our homes and hearts? Times may be tough, but they were often much worse for other generations. It’s a time for walking together, with hope and with music still in our hearts. Christmas is about a great Light in the middle of great darkness. It is about hope, about joy, in the middle of burdens. We’re in this, together. 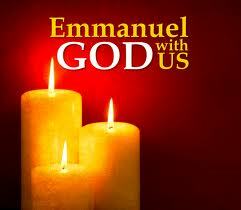 EMMANUEL means just that, ‘GOD WITH US’. Q. How can I ‘prepare a way for the LORD’ this coming week, with only 16 days left to Christmas? That question is my soul-food for this week! God bless you, mightily! Have a great week! ← Soul Food for Young Adults: Second Sunday of Advent, December 9th, 2012.